Since the default background color on Chemistry.SX is white, any image, whether it has an alpha-channel to it (e.g. PNG with transparency enabled) or not (e.g. JPEG of GIF) looks fine. However, quoted blocks (second layer of abstraction) have a different color ("Floral White" on main site, and "Solitude" on Meta). Dropping an image with a white background there creates third layer of abstraction, making it look like the image is not the part of the quote, but rather that they belong to the main text (since it also has white background). To my eyes version with no background looks more superior in terms of visual appearance and layout. Technically there is virtually no difficulties in switching between both representations back and forth; however I think that preparing the graphics in PNG format with transparent background should be preferred. What do you think, is it a reasonable suggestion, or just some bells and whistles? I generally insert chemical structure diagrams and similar images as already suggested in the question. First I draw the structure in ChemDraw (in accordance with styles recommended by ACS and IUPAC as far as possible). I save the image directly from ChemDraw as PNG (not as JPG!) with a transparent background. For better results on retina screens and similar high-resolution displays, I set the resolution of the saved PNG image to a value that is higher than necessary (usually double size). Finally I place the image in the post using HTML and force the display size back to the original size (i.e. usually half of the size of the saved PNG image). Just so that we have a conclusion: this is one of the many things where it should definitely be preferred, but not enforced. Not many people post ChemDraw images anyway, Loong and myself are part of a small handful of people. For ordinary images I don't think I'll bother changing my workflow, but if I see white backgrounds in quotes then I'll try to edit them as per Loong's suggestion. Since images remain untouched, the transparent ones blend-in with the page background (same problem that people face when preparing graphics for the presentations with black background). The only solution I see is to add contrast thin outer layer to every object on the transparent canvas. But, as other answers suggest, this is often considered too complicated and breaks many workflows; so I guess in the end it's up to OP to decide how deep she/he would go down the rabbit hole in editing own graphics. 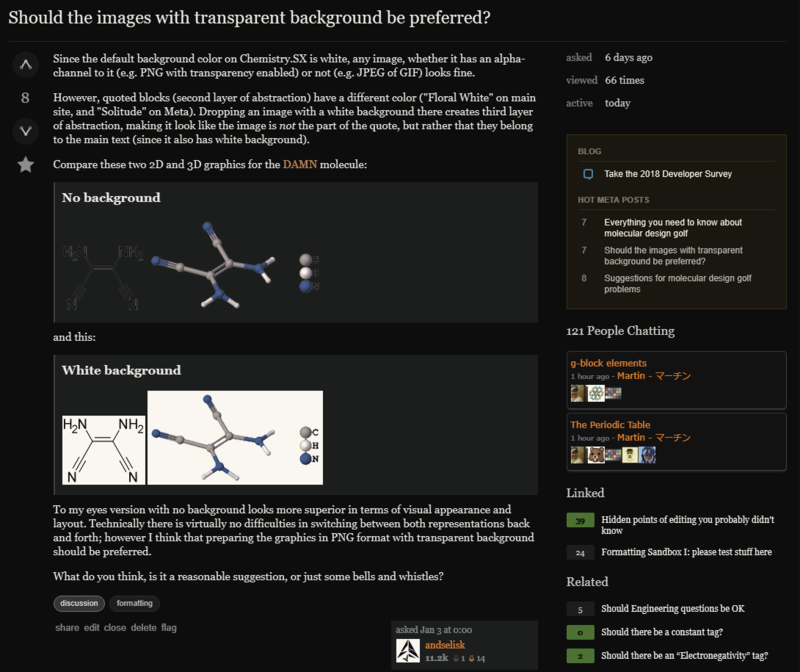 One thing to know about transparent backgrounds is that it breaks Stack Exchange’s (hosted by imgur) image scaling feature. For instance, take the image with the URL https://i.stack.imgur.com/ZAS5s.png. This image has a white background, and if we append certain modifiers to the file name, we can scale the picture. The result can be seen below. Personally, I have no idea how to determine the ‘correct’ size of a ChemDraw image and I’m not really sure I mastered how to set it correctly. So a white background does offer a much more easy way to scale. What can or should be done about the unanswered?